Last week, I was sitting in a product meeting at work. Our CTO was eating a banana and as he set the peel down on the table it struck me that it would make the perfect vessel to hold food. Since then I’ve been mulling over all the different ways one could cook food in a piece of the fruit that’s come to symbolize rubbish. I began to fantasize about fork tender hunks for moist pork surrounded by rice infused with the flavors of banana and the savory pork. Over the following week I decided that a Cuban mojo would make a fine marinade (although I’d considered using a tamarind based marinade). My biggest concern was that the astringent taste of the peel would ruin the contents. Upon doing some research I found that banana peels are used in some regions of India to make chutney. I also learned that there are some nasty pesticides used on bananas so I decided it would be best to use organic bananas. Beyond that I found nary a reference to cooking with banana peels. My first inclination was to roast them at a low temperature, but after thinking about it for a bit, I realized that the dry heat would make it take a lot longer to make the meat tender. I was also thinking that it could potentially render the rice inedible. In the end, I decided to steam the bundles. As with most things one fantasizes about for days on end, this didn’t quite live up to the high expectations I had, but that’s not to say it wasn’t good. As expected, it had a fairly strong banana flavor, so if you don’t like bananas, this might not be for you. The meat came out incredibly moist and tender and the rice was cooked perfectly, soaking up the flavors of the peel along with the juices from the pork. The next time I do this, I’m going to try serving it with a salsa… maybe a mango coconut celery salsa. The night before you want to eat these, make the mojo in a large ziplock bag. Cut the pork up into cubes that will fit into a banana peel and add to the mojo. Squeeze out as much air as you can, seal then put in the fridge. Put the rice in a bowl and cover with salted water (should be saltier than soup but not as salty as the sea) and put it in the fridge. 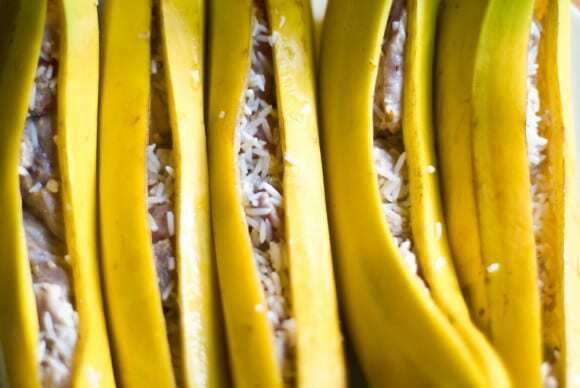 To prep the stuffed bananas, cut a slit down the inside of the curved part of the banana from top to bottom. Open up the banana and gently remove the insides, setting aside for another use. Drain the rice and stuff each banana peel with rice and meat making sure not to overstuff them. 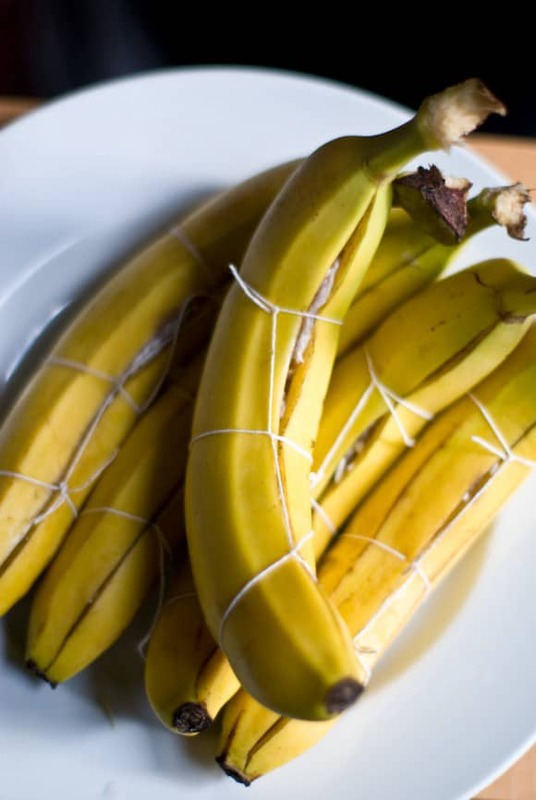 Using some kitchen twine, tie the banana back together like you would tie a roast about 1.5 inches apart. 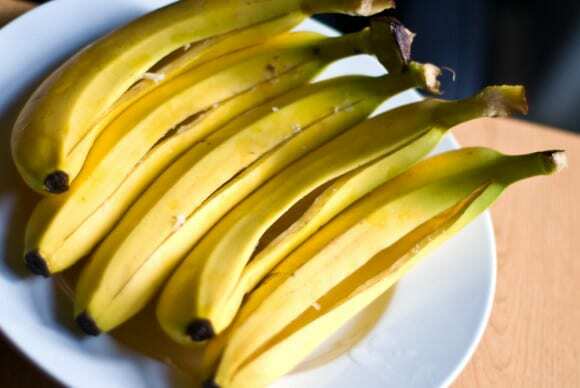 Get your steamer ready and place the bananas in it cut side up. Place a piece of foil over the pot then cover with the lid making sure to get a good seal. Steam for 1 hour. Remove the twine and serve. Note: The peel, while edible (tasted a bit like artichoke) wasn't my cup of tea so I skipped it. what a beautiful dish! It looks amazing! Very cool concept! I would have never thought of doing that, but it is genius! Great recipe! to say that this is brilliant would be an understatement. i’m madly impressed by your creativity and execution–nicely done! Great idea! This reminds me of the bamboo steamed rice dishes we had in China. I can’t wait to give your version a try. How interesting! We think of banana leaves, but not the peels. Maybe I’ll give this a shot with somethign seitan-y. I love this idea! Makes the dish look so pretty! Very creative! Who knew bananas were into S+M!? Kidding! Couldn’t resist after the first pic! This looks so tasty! 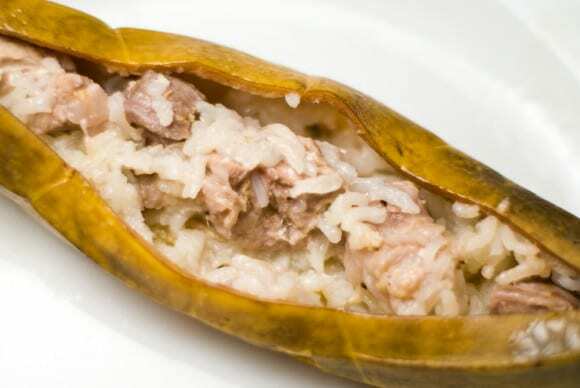 Steaming rice and tasty pork in a banana peal sound like fun. I really like the sound of rice infused with the flavour of banana! Nice and creative! This is a very interesting presentation! Usually, the banana peels end up in the compost bin around here. I have to say that is one of the most interesting recipes I’ve seen in a while. Thanks for sharing that, it’s cool. Hi, I’m italian and since I lived in different country I like recipes from all world, expecially this one: I think it has something really creative, I will try to prepare it hoping to discover a new taste! Yum. I have a recipe from my childhood with pork, banana, sultanas and apple cider wrapped in foil and cooked. Its great. You could probably play with that and wrap in banana peal and pour the cider over it to cook. Also banana is used a lot in Samoa. 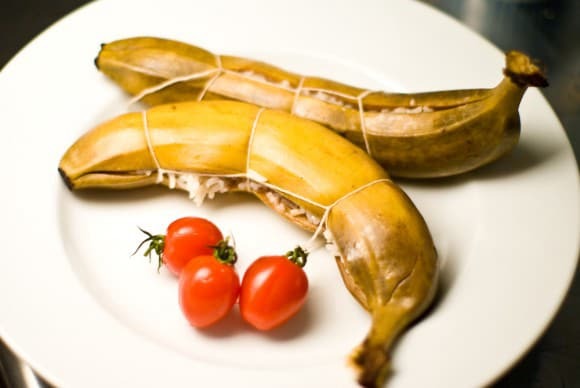 They cook it many ways including small very green bananas cooked in their skins and used as as a vegetable. This is very cool; I found this after doing some research on ways to eat banana peels since they are excellent sources of dopamine and norepinephrine–plus they get rid of heavy metals such as lead! I must try this! I would add shrimp or something else instead of pork…as pork is unhealthy and need to be cooked properly! pretty sure shrimp needs to be cooked properly too …. Pork is as healthy as shrimp. Time for you to read up.